Two weeks ago HuffPost published an article about my story and about an article from INC regarding "communication within Tesla", an email sent by MR. Elon Musk and to which I replied twice. Last week Tesla sent a comment to the article of 610 words, completely parallel to what the article was about! Last week, a day after Tesla asked HuffPost to add their "note" or comment to the article, I asked the same thing, which didn't happened. In the mean time during these two weeks, I received dozens and dozens of messages and emails supporting my courage to speak up, in and out side of Tesla and I thank you all for that. Because of them I decided to write this article. "At Tesla, employees are expected to solve substantive work problems by communicating with anyone at any level or department within the company according to what is the fastest way to achieve the best possible solution. This is fundamental to how communication works at Tesla, and reflects the importance of putting the best interest of the company ahead of any particular department." The truth: In this statements The HUGE discrepancy is between what is “expected” and what is really happening in there! In the first three months of my second employment, after saving hundreds of thousands of dollars (more than half of the cost allocated for the project) by redesigning some components of the A-pillar and reducing the number of unique parts to half, I was brought to a room by my manger and told not to present my solution to our Chief Design Officer, because “you make us look bad”. Luckily for me two of the women engineers from another group involved in the project, helped me do just that. This is where all started: I dared to put my manger and my lead in such an awful position in front of the higher management, because from their point of view saving money made them look bad. 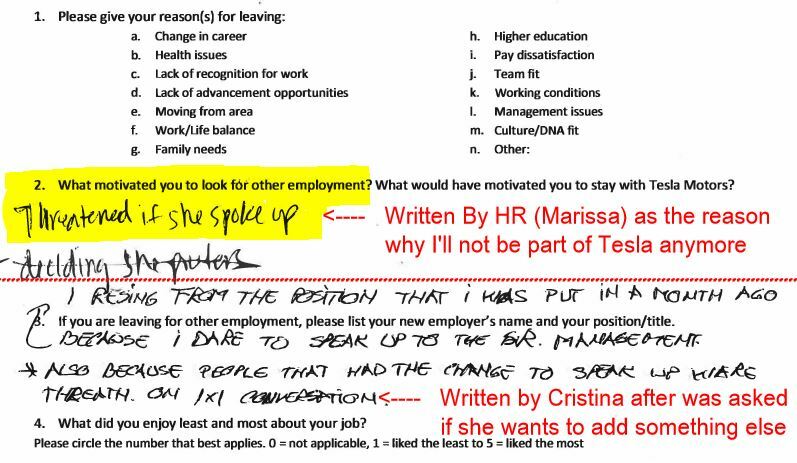 When a HR manager writes and a legal departments agrees with that in an exit interview or a " resignation" as Tesla called it, you do have a problem high up! The truth: Wrong, esteemed spokesperson and legal department persons (I’m sure there were more than one), my blog and the articles that will follow are intended for people to look at the evidence not theories! And, as they say, a picture is worth a thousand words. Same is true for the articles you tried (and succeeded) to stop from publication. They were showing evidence, not words twisted by professionals and “people trained to do that” as a PR person told me once. The truth: My so called "secret project" was approved on the highest level in Tesla after Elon! 3 VPs, a few directors and mangers were involved and Tesla knows that as they have the evidence! 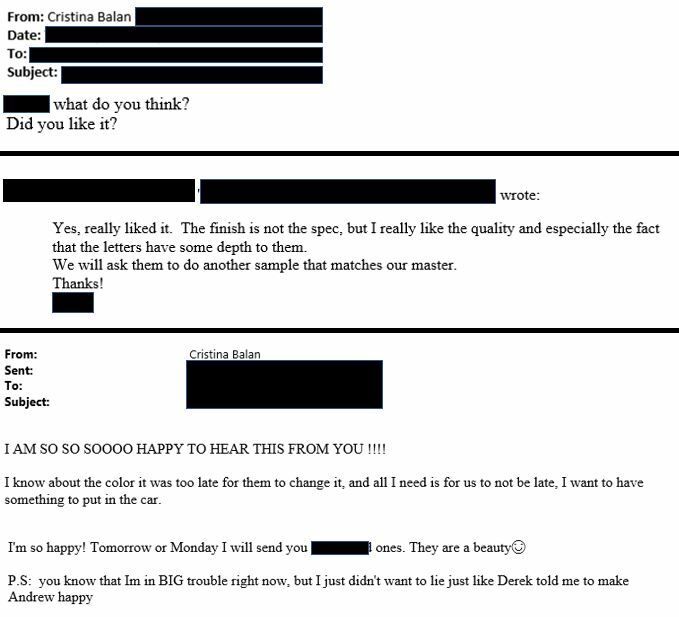 Here we come to the “secret project”: I really don't have any words reading what Tesla commented on this… but this is the thruth of what really happend: Sometime in the late 2013 we were trying to solve an issue for Model X. The giant glass ceiling required a radical departure from the traditional way of doing things. I had a “flash of genius” and this is how the “secret project” came to life. My manager was not thrilled, and I was told that “a woman’s brain cannot handle a patent or the coordination work for a prototype of such complexity. You have to give it to the right people to make it happened”, but I cannot prove that is my word against his right … Nice encouragement though – isn’t it? Well, I did not gave up and I went to his superior (the director of engineering) who asked me to present it to the group. So much for the secret part. I also told my direct manger that I thought about it at length and I don't want to give it away and I have all the intentions to show a woman can finalize her own patent idea. After that meeting my mangers told me that he present the idea to all the Sr management that takes the decisions on patents and future projects and that My project was rejected and I'm not allow to work on it anymore. Luckily for me Because of that meeting a lot of other directors, mangers and VP's found out and asked me what is going on with it and when can they see the first prototype. 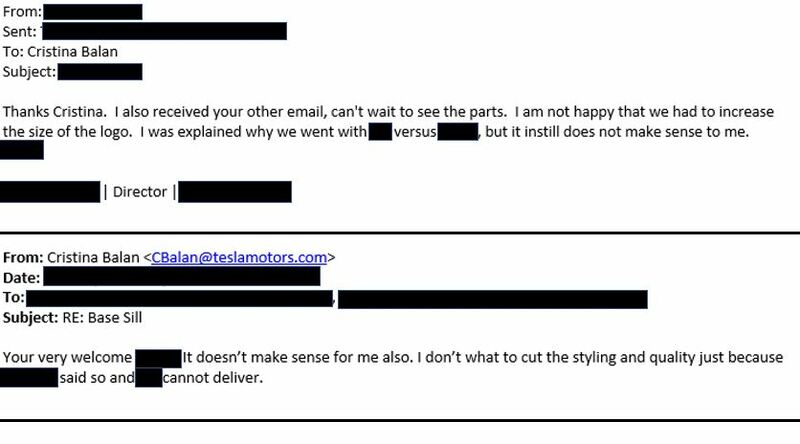 I was a bit puzzled and I told them I was asked to stop working on it from the Sr management of Tesla and told them the story. Some they've got very angry and worried because the Sr management never said anything like that. 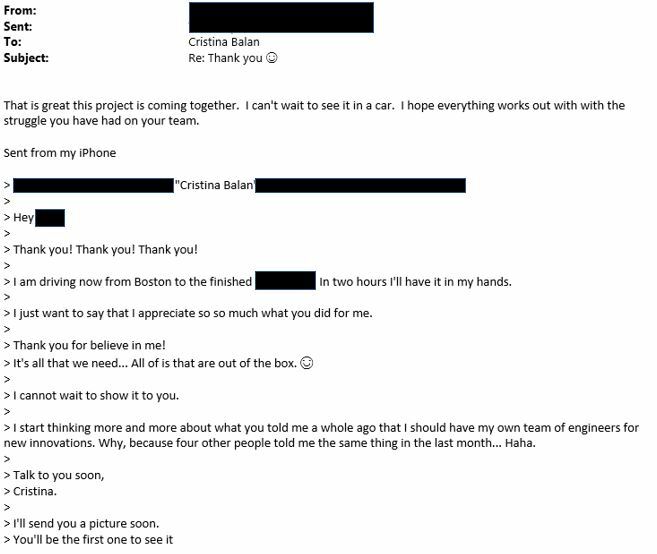 Immediately after that a few of Sr directors and VPs had a meeting about me on the highest level of Tesla and decided they will allow me and support me with money and resources (people I needed) to finalize this, because they really want to see the prototype. In the same meeting they've decied is better to keep it secret: only between the VP's involved and the entire team that I had to put together, taking into account my situation with my direct management. This is what I received from my manager after he told me numerous times that the senior management is not interested in my invention idea …. 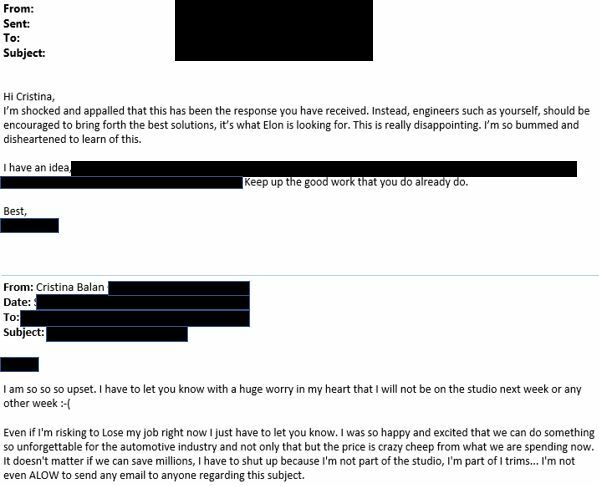 Here are some emails from hundreds I have related to the "secret project". I am ONLY showing you the ones exchanged with people at the highest management level in Tesla after Elon Musk. And this one was to let them know the car is ready for Elon to see… It was THE MOST amazing day of my career and I cound't do it without the help of the VPs … Thank you all ! The issue of “particular supplier I took upon myself to find” is a grossly twisted truth, here to serve Tesla’s point. This was one of the three possible suppliers suggested by Tesla’s own purchasing department. An engineer, no matter how good or how senior he/she is, cannot do that. The suppliers are recommended by the purchasing team. This was the only supplier (out of three) who could meet the deadlines and the quality required and at a price several times cheaper than the next contender. How it was eliminated does not have anything to do with any “site inspection” however, this is subject to another article, so I will not touch it here. This lie can be easily proven by facts. For the argument sake: anyone who was ever part of a design team knows that to go thru with a supplier design request you need management approvals, and a higher-level manager’s signature on the PO; And all these things happened, because we had a prototype built based on my design… so it was again a team effort that my direct managers were not too happy about. IT HAPPENED because many other managers from too many teams got tired to accept the behavior of these two or three people that I was “lucky” to have as my direct supervisors. I am not one of the people who blame everyone because one bad event, but it's time for Tesla to assume some responsability for what happened to me! After the backup plan was aproved, the PO released to the supplier and i've got the ok to start the project, I began working day and night with the supplier's team overseas to recover the time lost… and in 3 weeks the parts were delivered to my directors and managers. After the meeting above where the director and our CDO confronted my direct managers, I was demoted, humiliated and all my projects were taken away from me, as a lesson for others not only for me. The truth: To summarize the repeated quality “not safety” issues, I will say just this: if your headliner falls on your head, doors are locking and trapping you inside, trims are rattling and buttons are falling, who gives you the right to complain? If you do, they might decide not to sell you another great Tesla car! – it happened at least once. "She also illegally recorded internal conversations within Tesla without anyone’s permission, which is clearly criminal conduct." The truth: I do not want to touch the subject of the recordings, as the Judge is still deciding about the motion Tesla introduced to reject them from the evidence. 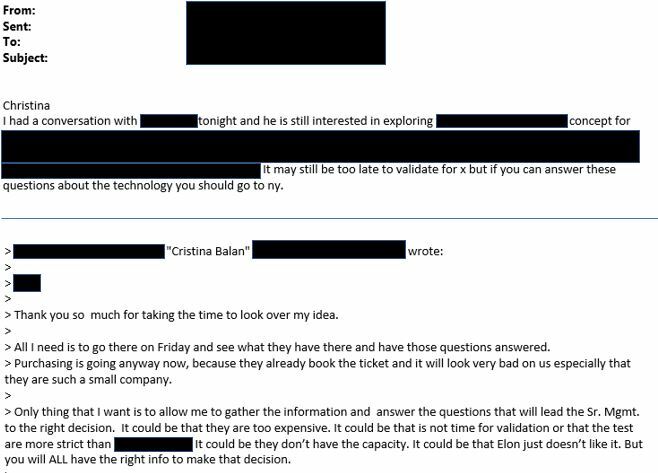 The judge already denied Tesla's motion to reject my IT expert for the missing emails issues, or my other Experts that Tesla request to be rejected… The recordings were made for the sole purpose to show Elon Musk how bad the situation is and at least for now, I will keep this private! ”Finally, contrary to Ms. Balan’s claims, despite her own misconduct, she was never fired from Tesla. She voluntarily resigned – not just once, but on multiple occasions." The truth: To conclude this not-so-short response, I have to touch the “numerous resignations” subject: without too many details, my family required me to spend more time with them, so I informed my superiors in the spring of 2012, that I might have to resign in order to care more for my family. This is when I was suggested to work half time from home – while Tesla will cover my travel expenses, as my work was too important for the company to let me leave. The second resignation notice I give them in December 2012, without any connection to the “living stipend”. I rescinded on the decision later and everybody was more than happy I did that. All until I talked to much about the reason I changed my mind: the possibility of having breast cancer… and the resignation was accepted immediately or as they said to me "we changed our mind"! 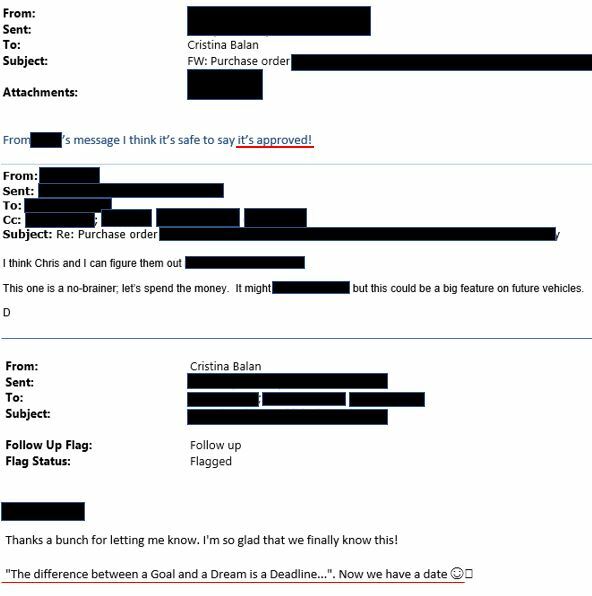 The final “resignation” happened three days after I sent the first email to Elon Musk, and was signed under duress, with two goons at the door and threats that not only I will be thrown out and be humiliated, but more people will be fired, for siding with me, and they will have to leave US as they were employed on temporary work visas…. 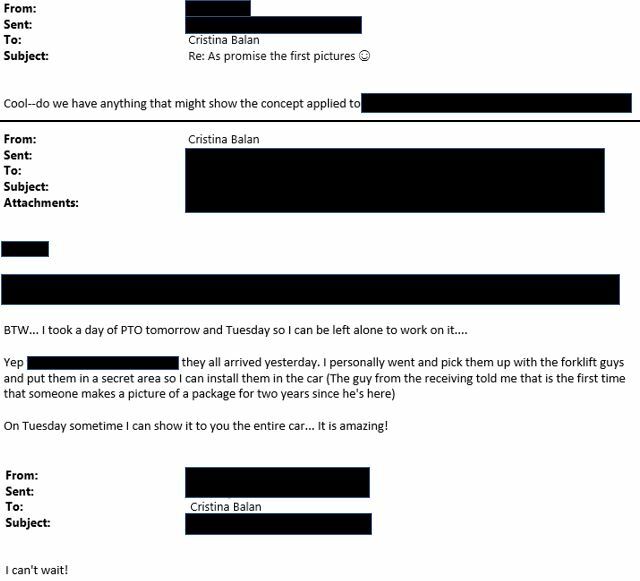 It was a rush job from HR part, (as I was supposed to meet with Elon Musk several hours later too continue the discussion we started two weeks earlier about the “secret project”) and they made some mistakes as the evidence will show. Looking back at the facts, the whole thing looks like a Hollywood mobster movie, because each time they threatened me and push me down, I stood up again. I don't know about a movie, but maybe one day I will write a book about this. Who knows? Hopefully what I showed you and share with you, will help you draw your own conclusions ! Tesla never responded to the statement that it instructed Ms. Balan to destroy all her evidences especially the recording she made “are for Elon ears only”. Tesla never responded if Elon Musk knows and listen to the recordings that clearly proves a lot especially the communication within Tesla. 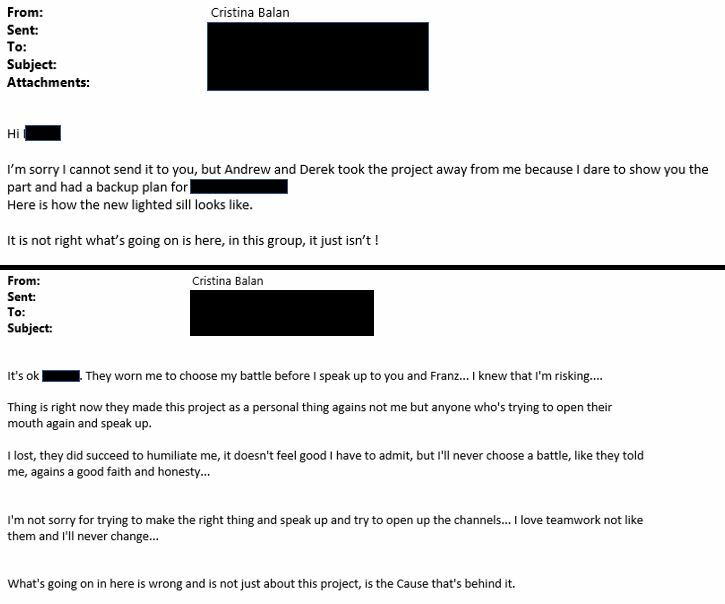 Tesla is again spreading falsehoods about me because they still want to cover up on the retaliation I suffered after I expose some very problematic practices at Tesla. What I would like to say now is: when engineers are forced to not help each other, just because they are from different teams, or are demoted for daring to talk with a Director or a VP, being warned, by low level management, multiple times, not to do it, when people are taken in rooms on 1:1 to be “convinced” to drop complains or request of investigations, you Do have a significant management problem. " © 2019 Cristina I Balan. All rights reserved.